The Polar Scout or ORS 7 (Operationally Responsive Space 7) mission consists of satellites, that are capable of detecting transmissions from emergency position indicating radio beacons (EPIRBs), which are carried on board vessels to broadcast their position if in distress. 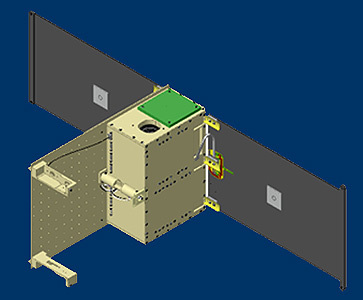 The Coast Guard will deploy the cubesats in cooperation with the Department of Homeland Security (DHS) Science and Technology Directorate’s Polar Scout program, the Air Force Operationally Responsive Space Office, and the National Oceanographic and Atmospheric Administration (NOAA). They are built to the 6U CubeSat form factor. Each Polar Scout cubesat will pass over the North Pole every 90 to 100 minutes and will be able to detect EPIRB signals from vessels in the Arctic for about 12 minutes on each orbit. The cubesats will circle the earth 15 or 16 times a day, providing more than three hours of search and rescue coverage in the Arctic daily. Millennium Engineering and Integration is preparing the satellites for launch in mid-2018 with the help of Space Dynamics Laboratory and Raytheon. The satellites are to be launched on Spaceflight Industry's SSO-A multi-satellite launch on a Falcon-9 v1.2 (Block 5) rocket.